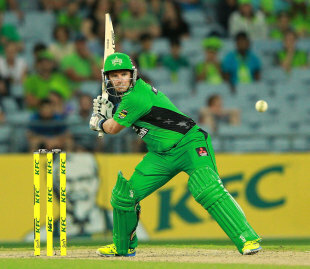 Brad Hodge might be holding on to a slim hope of being called up for the World Twenty20 after Australia's selectors named him in the Prime Minister's XI to take on England in Canberra next week. Hodge, 39, has been a Twenty20-only player for just over two years but will play in the 50-over match alongside fellow veteran Brett Lee, who will captain the team on Tuesday. In 2012, Australia sprung a major surprise by recalling the 40-year-old spinner Brad Hogg to the T20 side based on his form for the Perth Scorchers and he was retained until the World T20 in Sri Lanka later that year. It is not out of the question that Hodge, who is T20 cricket's all-time leading run scorer, could be similarly recalled this year with a World T20 to be held in the first half of the year. Hodge and Lee will be the senior players in a Prime Minister's XI that features several players who could be considered for international call-ups in the near future. Jackson Bird, Ben Cutting and Alister McDermott will for a strong pace attack while Luke Pomersbach and Chris Lynn will be keen to press their credentials as powerful batsmen. "Brett Lee and Brad Hodge bring leadership and experience to the team and will be great drawcards," national selector John Inverarity said. "Chris Lynn has been in excellent form this season in all forms of the game. Jackson Bird is recovering well from injury and we are keen to increase his workload. "We have also been pleased with the progress of left-arm orthodox spinner Clive Rose, who has performed well for Tasmania in the Sheffield Shield. ACT local Michael Spaseski is a promising young batsman and provides a great cricketing story. He is a first generation Australian of Macedonian parents, who knew nothing about cricket when they first came to Australia."